Removes up to 90% of surface stains in 2 weeks. The brush head has a stain eraser that gently polishes away surface stains to help whiten teeth. Flexing toothbrush head design adjusts to clean the unique curves and contours of your teeth and gums. 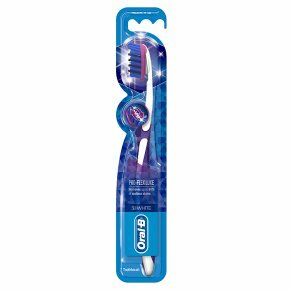 Gentle on gums.Oral-B 3DWhite Luxe Pro-Flex manual toothbrush has a dual-flexing head design, which combined with its unique Stain Eraser, works to remove up to 90% of surface teeth stains in just 2 weeks. Gentle on gums, but tough on stains, this is the toothbrush you can trust to get a smile that turns heads. Children of 6 years and younger, use a pea sized amount for supervised brushing to minimise swallowing. In case of intake of fluoride from other sources consult a dentist or doctor.